Journaling my genealogy research online seems to be the right thing to do for the future of my research rather than hiding it away in some box or drawer in my home. This blog is more of a diary of my research which expands as I go. Know that a post from last year may have more updated research in a different post. I love the discovery process which has resulted in such wonderful success in finding my roots. If you comment and are looking for a response, please leave me an email address. Note: For privacy reasons, living people are not identified in this blog without permission. If you would like to be contacted about a comment, you must leave me a way to reach you. Please include your email address. Thank you! Patrick Hickey was my great grandfather but this was also the name of my 3rd great grandfather, too. Let me not forget to mention that when I research my great grandfather, Patrick Hickey, in NYC, I find 3 others around the same time. I also kind of get the feeling that I'd find at least 3 (or more) additional Patrick Hickey's in County Clare around the same time that my Patrick Hickey was there. Chalk it up to Patrick and Hickey being a common name in the Western part of Ireland and in NYC circa anytime from 1850 to say 1950. To find out more about my Hickey roots, I took a long break from my research. Recently, I started thinking about the specific location of my Hickey's. I have actually been in brief contact with distant Hickey relatives via email who refer to Loughatorick as "going home for a visit" even though they don't live there any longer. They do still live in Ireland. Relative to the USA, it is not a very big place. I decided to Google Loughatorick. I'd didn't find Hickey's and instead found the following. Ruins of Hayes family cottages and outbuildings abandoned circa 1922.
and outbuildings abandoned in 1922. Patrick Hickey, my 3rd great grandfather was born in 1819, Loughatorick, Galway, Ireland. Woodford is also mentioned somewhere in the history that I have about the family. Anyway, Ellenora Hayes was his wife, my 3rd great grandmother. So, maybe just maybe, I found the old family farm. It's ruins in this day and age. That is not unusual, I suppose. I rather like the fact that the Irish leave their ruins in place. In my review of additional search results for Loughatorick, I find it as being in County Clare. 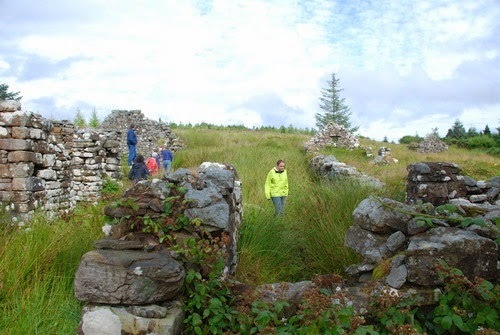 I have previously written about my ancestors living on the border of Counties Clare and Galway. The Griffith Valuation altered the border in the mid 1860s. The Loughatorick of my ancestors prior to the 1860s was in County Galway but it may actually be in County Clare these days. Needless to say, it is the same location. I hope to find more someday. Reality is that I may not be able to find out any more of my family tree beyond Patrick Hickey (b.1819) and Ellenora Hayes. I'd be okay with that for now. This is Martin Brendan Hickey 3rd. Patrick Hickey and Ellen Hayes are my 3rd Great Grandparents. I have been in contact with a few cousins in Ireland. I have a great deal of information that may carry you back a few generations. Hi. I'm from Loughatorick! Was fascinated to see this post. Loughatorick townland is still in Galway, although most of the lake itself is in Clare. There are still quite a few Hickeys around the area, although the last Hayes family left some years ago. "It is a most useful art, this photographing, by which one can from one end of the world to the other [send] a pretty correct representation without writing a word about it." Below you will find a poem that I found in a "Birthday Book" that belonged to my Grandma. It was the book's dedication by Rev. Hugo W. Hoffmann. I think it represents some of what genealogy is all about. Make slight impression, and are soon effaced. Nor lose their lustre till the heart stands still." Copyright zelsersk 2010. Watermark theme. Powered by Blogger.